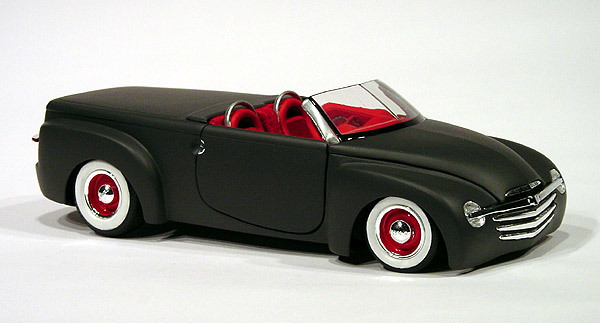 I built this 2003 Chevy SSR "rat rod" pickup by using a Maisto 1/25 scale diecast replica. 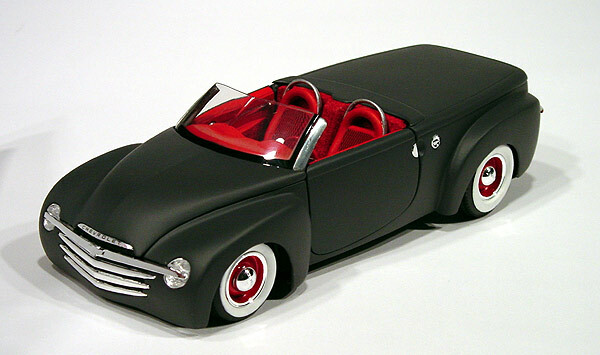 Originally, I bought the replica just so I could use the wheels and tires on my custom Buick Rendezvous. After I disassembled the replica, I got to thinking that this would make a pretty cool looking "rat rod" style street rod. So, I stripped off it's original blue paint and started rebuilding. First, I decided that it would look better with it's top down. Using a band saw, (this is a metal model after all) I cut off the roof and ground down the rough edges with a grinder. 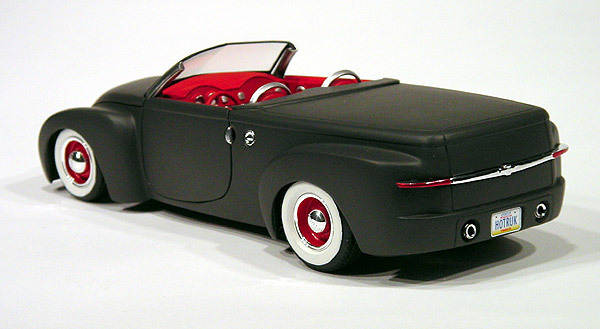 To finish off the chop job I added a scratch-built tonneau cover behind the seats and trimmed the height of the windshield and it's posts down about an 1/8". Next, I buffed the windshield posts to a polished finish and decided to leave them unpainted. Other bodywork includes filling in the recessed driving lights up front and the round taillights out back for a smooth custom look. For taillights, I just painted the ends of the chrome strip across the tailgate to make them look like a blade style. Then the body was painted with a custom mixed shade of dark primer gray. 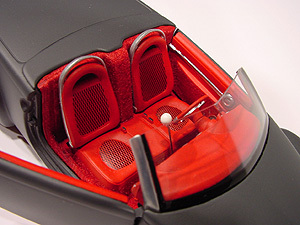 The interior was detailed with red flocking to simulate carpeting. 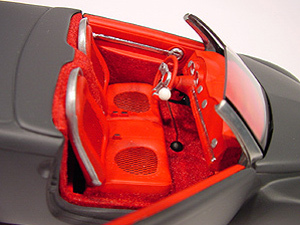 The fifties style seat pattern was made using decals from Scale Motorsports. And, lastly I made an old style tall shifter from needle globbed with 5 minute epoxy at both ends to represent the ball and boot. Lastly, I reassembled the model, dropped it in the weeds, and put on a set of big and little meats. 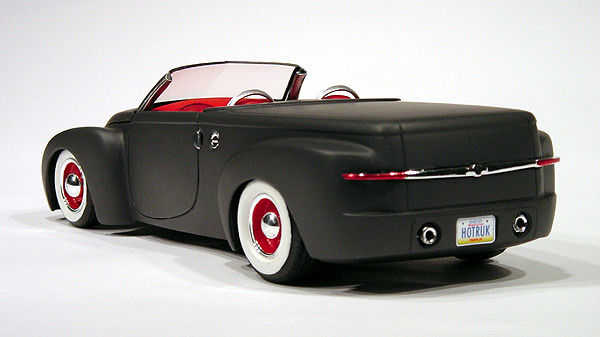 The wheels and tires coming from a Monogram Beach Boys 32 Ford kit. The wheels were detailed with hand painted white wall tires and red steel wheels. The hub caps came from a AMT '53 Chevy pickup kit.